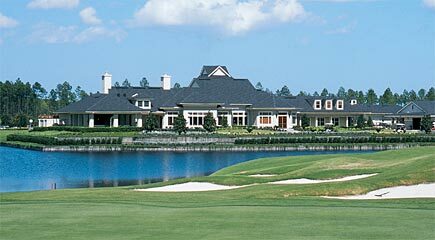 St. Johns Golf & Country Club in Jacksonville, Florida. St. Johns Golf & Country Club offers the gentle, quiet lifestyle you deserve. Set in the northwest corner of highly desirable St. Johns County, in the Jacksonville area, this ideal location is close to excellent schools, shopping, restaurants and downtown businesses, yet removed from the hustle and bustle of everyday life. This hallmark St. Joe (formerly Arvida) Hometown brings you the home and lifestyle of your dreams. It's time to live a little -- and enjoy life a whole lot more. Visit St. John's Golf and Country Club for quality new homes in Jacksonville. St. Johns Golf & Country Club is a 799-home community filled with activity, laughter and life. The community features the 18-hole, 7,200 yard championship course, designed by renowned architect, Clyde Johnston, four tennis courts, aquatic center with six-lane swimming pool, children's wading area and waterslide, two basketball courts, fitness facility, multi-purpose sports field and tot lot. See sitemap. Community builders are St. Joe Towns & Resorts and Morrison Homes. St. Johns County is a unique place where important history, natural beauty and economic progress are friendly neighbors. With nearby beaches and waterways, preserved wetlands, eclectic shopping and dining, and easy access to downtown Jacksonville, it's no wonder St. Johns County is one of the First Coast's most desirable areas. Homes range in price from the $300's to $400's. For a private tour and showing, please call (904) 307-8998.